Trails in Redwood National Park are somewhat limited, owing to the steep, inaccessible terrain, and because much of the vast backcountry area was extensively logged prior to establishment of the park in 1968, so is now covered by monotonous new growth forest. The most extensive network of paths is along Redwood Creek and over the hills to the west, though many of these routes are used primarily for horse riding, and do not encounter interesting scenery. 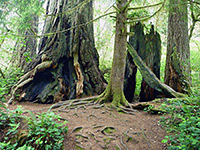 For day hikers, popular destinations are limited to Lady Bird Johnson Grove, Trillium Falls, Hidden Beach and the lower end of Redwood Creek. The Redwood National Park map shows the location of the southern trails. 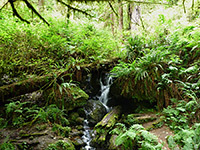 See also hikes in Del Norte Coast Redwoods State Park, Jedediah Smith Redwoods State Park and Prairie Creek Redwoods State Park. Berry Glen Trail 3 1,200 The recently built Berry Glen Trail provides an alternative way of reaching the famous Lady Bird Johnson Grove; like Bald Hills Road it ascends from Prairie Creek valley, starting in a sheltered basin then climbing a steeply-sloping ridge, which is followed all the way to an intersection with the loop path near the 1969 dedication site. Coastal Trail 3 500 Just north of Orick, a short road heads a little way west along Skunk Cabbage Creek to a trailhead for the Coastal Trail, the section which leads northwards into Prairie Creek Redwoods State Park. The hike to the coast from here is 3 miles, passing a few redwoods near the beginning but for most of the way following a shallowish valley filled with regular trees. The last part climbs to a ridge overlooking the Pacific then descends to the beach, at a point just over a mile south of Davison Road. Dolason Prairie Trail 5 2,200 The higher stretches of Bald Hills Road cross treeless, grassy terrain, and more of this landscape can be seen along the upper part of the Dolason Prairie Trail, beginning 11.5 miles from US 101. The path descends all the way to Redwood Creek, initially through a mix of grassland and conifer forest, then past redwoods at the lower elevations. A one mile connecting path near the creek links with the road to the Tall Trees Grove. Hidden Beach Trail 0.7 50 Hidden Beach is small, secluded and scenic, lined by tidepools, piles of driftwood and weathered rock formations. A photogenic, steep-sided rock lies a little way out to sea, topped by a few wind blown trees. 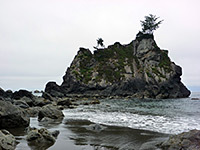 The beach may be reached either by a path starting immediately north of Trees of Mystery along US 101, or via the Coastal Trail branching off the Yurok Loop. Lady Bird Johnson Grove 1.4 (loop) 100 The most popular trail in Redwood National Park loops around a fine collection of old growth redwoods on a level hilltop, passing the site of the 1969 dedication ceremony, attended by the wife of the 36th president, after whom the grove was named. The trailhead is 2.5 miles along Bald Hills Road. Lost Man Creek Trail 11 2,000 Appealing primarily to cyclists or horse riders, the Lost Man Creek Trail (an old logging road) follows an overgrown drainage past a couple of miles of original redwoods, then climbs steeply through second growth forest to Holter Ridge. Turning south, the route stays on this wooded ridgetop for several miles, to an intersection with Bald Hills Road. A 20 mile loop can be made by heading down this road then up US 101 to the trailhead, at the Lost Man Creek picnic area. Redwood Creek Trail 7.5 200 This long trail follows Redwood Creek from a spur off Bald Hills Road, all the way to the Tall Trees Grove. The full distance is hiked mostly by backpackers - dispersed camping is permitted after the first 1.5 miles - but the lower end is popular with day hikers, even though large redwoods are few in number. Instead, the surrounding forest is made up of a dense mixture of other kinds of trees, interspersed with meadows and ferns. Tall Trees Trail 1.8 650 Some of the largest trees in the national park may be seen via a lightly used trail that descends quite steeply through mixed forest including some smaller redwoods to the edge of Redwood Creek, ending with a short loop section around a small grove of much bigger specimens. A free permit is necessary to visit this area, and access is by a narrow, unpaved track, forking off Bald Hills Road 7 miles from US 101. Trillium Falls Trail 2.8 (loop) 370 Starting from the Elk Meadows day use parking lot at the south end of Davison Road, just off US 101, this loop trail first climbs a little way up a redwood-covered hillside to a small waterfall enclosed by mossy, fern-draped rocks, then descends gradually, passing a good selection of large trees. After crossing an old vehicle track, the path turns back and runs close to the east edge of the forest, still through some impressive redwood groves. Yurok Loop Trail 1 (loop) 100 The trailhead for this easy hike is at the Lagoon Creek picnic area, along US 101 one mile north of Trees of Mystery. 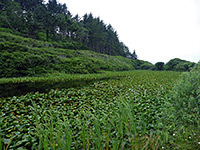 The path encounters mixed coastal forest (no redwoods), and has views of False Klamath Cove, sea stacks in the Pacific, and a lily pad-covered pond.